To block glare from the front, swing down the main sun visor. 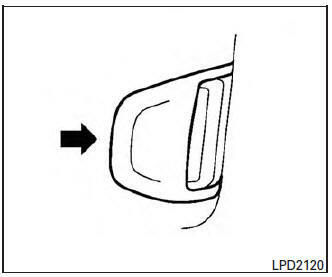 To block glare from the side, remove the main sun visor from the center mount and swing the visor to the side. To extend the sun visor, slide in or out as needed. Do not pull the extension sun visor forcedly downward. 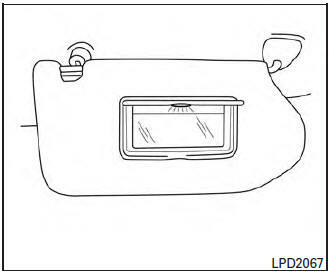 To access the vanity mirror, pull the sun visor down and flip open the mirror cover. The vanity mirror will illuminate when the mirror cover is open. 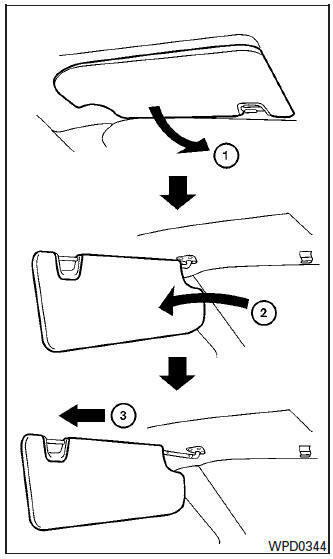 To access the card holder, pull the sun visor down and slide card in the card holder. Do not view information while operating the vehicle.